India slammed Pakistan for stating that it had no role in the Pulwama attack carried out by Pakistan-based terror group JeM, saying Islamabad could not claim that it was unaware of the presence of terror groups on its soil as the links of such outfits to the country were there for everyone to see. Pakistan on Friday summoned the Indian deputy high commissioner in Islamabad and lodged a protest against India's allegation of its role in the Pulwama terror attack. Hitting back at Pakistan, Ministry of External Affairs (MEA) Spokesperson Raveesh Kumar said: "JeM has claimed responsibility for the attack. The organisation and its leadership are located in Pakistan." The Lashkar-e-Taiba (LeT) and other terror groups had welcomed the news of the attack and those groups were also based in Pakistan, he asserted. "Pakistan cannot claim that it is unaware of their presence and their activities. They have not taken any action against these groups despite international demands, especially against groups and individuals proscribed by the UN and other countries," Kumar said. The links to Pakistan were clear and evident for all to see, he added. Pakistani ministers had shared the same podium with UN-proscribed terrorists, Kumar said. He asserted that the neighbouring country's demand for an investigation was "preposterous" when there was a video of the suicide bomber declaring himself a member of the Jaish-e-Mohammed (JeM). There were also other audio-visual and print material linking JeM to the terror attack, the MEA spokesperson said. "We have, therefore, no doubt that the claim is firmly established," he added. There was no constructive approach from Pakistan on its relations with India, Kumar said. "What we have noticed however, are claims to offer dialogue on one hand, while sponsoring and sheltering terrorists and terrorist organisations such as JeM on the other," he added. 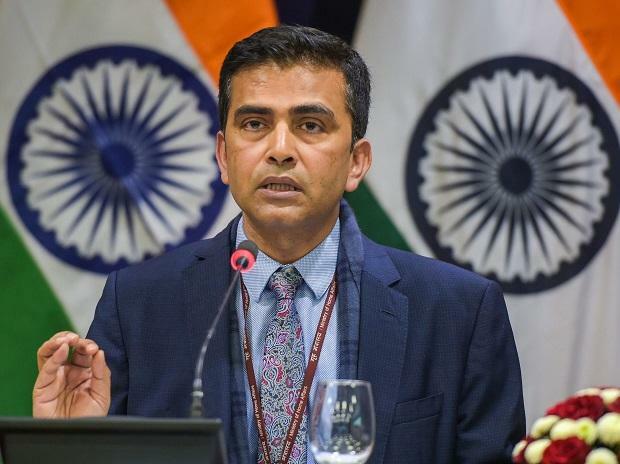 India demands that Pakistan should take immediate and verifiable action against terrorists and terror groups operating from territories under its control to create a conducive atmosphere in the region, free of terror, Kumar said. The JeM has claimed responsibility for the terror attack in Jammu and Kashmir's Pulwama district on Thursday that left 40 Central Reserve Police Force (CRPF) personnel dead and five critically wounded. The summoning of the Indian deputy high commissioner by Pakistan came after India, earlier in the day, summoned the Pakistani High Commissioner to India, Sohail Mahmood, and issued a very strong demarche over the killing of the CRPF men. Pakistan must take "immediate and verifiable action" against JeM and it must immediately stop any groups or individuals associated with terrorism operating from its territories, Foreign Secretary Vijay Gokhale told the envoy. Though Pakistan's Foreign Office has not issued any statement, sources said it summoned the Indian deputy high commissioner and rejected the "baseless allegations made by India" against Pakistan on the Pulwama attack. A short video clip of the Indian diplomat leaving the Ministry of Foreign Affairs in Islamabad was also circulating on social media platforms. Meanwhile, in a tweet, Pakistan's Foreign Office spokesperson Mohammad Faisal said Foreign Secretary Tehmina Janjua briefed the ambassadors of the US, Russia, France, the UK and China on the Pulwama attack on Friday and rejected India's allegations. Following the terror strike, India withdrew the "most-favoured nation" status to Pakistan on Friday, a move which would enable it to increase customs duty on goods coming from the neighbouring country. In a media briefing after the meeting of the Cabinet Committee on Security (CCS), Finance Minister Arun Jaitley said the most-favoured nation (MFN) status to Pakistan stood revoked. India had granted the MFN status to Pakistan way back in 1996, but the neighbouring country is yet to reciprocate. Meanwhile, Pakistan's Information Minister Fawad Chaudhry said in an interview that his country would take action against anyone if India shared evidence.